I like to read Serious Eats, but can't always find the time, especially when I'm trying to get a book written. So I keep up with the more interesting posts via their various newsletters. 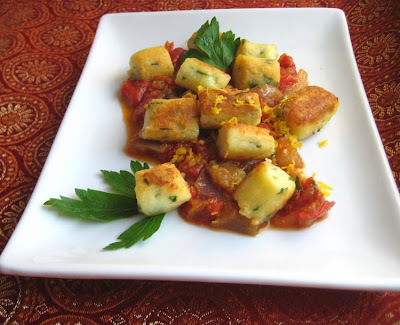 One recipe newsletter taunted me with Parisian gnocchi. I *love* gnocchi, and from time to time I make a batch of the easy sort that involves lots of ricotta cheese and a bit of flour. I've made potato gnocchi in the past, too, albeit unsuccessfully, so I haven't attempted those again. But Parisian gnocchi - those are a completely different animal. I've been meaning to make choux pastry, something I've never attempted, and figured this was my chance. 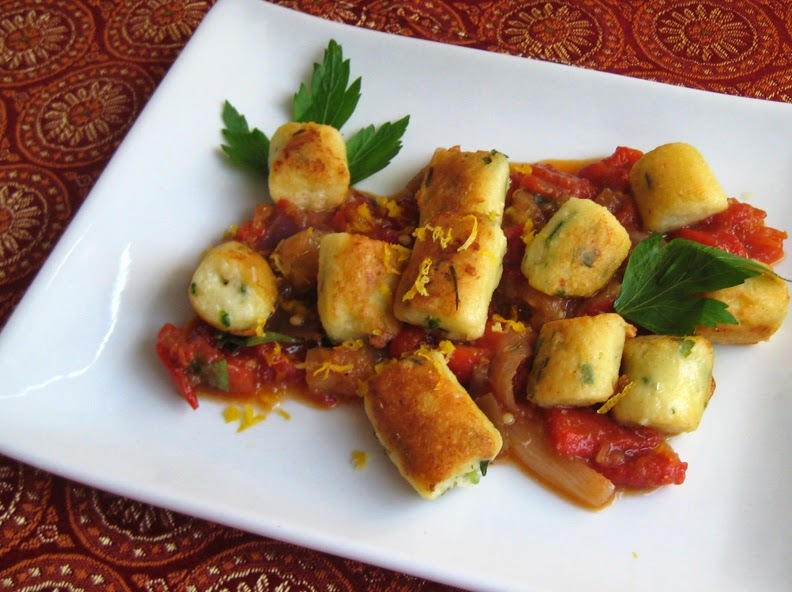 For Parisian gnocchi are essentially gougeres that are boiled rather than baked. And who doesn't like a cheesy, eggy, gougere? Kenji Lopez-Alt's recipe calls for chopped parsley, chives, and Parmesan cheese. I had the first two ingredients, but not the third, so I used half a cup of various other bits and bobs of cheese (we always have several varieties of cheese in the house) including Jarlsberg and a tangy English cheese flavored with chives. And rather than using the accompanying topping recipe involving corn and zucchini, I whipped up a little something caponata-like with produce from our garden. Place diced eggplant in a colander and toss with salt. Allow to sit for 30 minutes, then rinse and drain thoroughly. Cook the onion in a bit of olive oil until translucent. Add the rinsed eggplant, tomatoes, and peppers, and cook for an additional 10-15 minutes, until the eggplant is tender. Stir in vinegar and sugar and cook an additional minute or two. If the vegetables seem inordinately juicy, turn up the heat and boil excess liquid off. Taste for seasoning and add salt and pepper. Serve with Parisian gnocchi that have been pan-fried in a combination of butter and extra virgin olive oil until they are lightly browned and crisp on the outside. Serve garnished with the lemon zest and parsley.